I have one full-time job and two part-time jobs but none of them seem like work to me. I’m a full-time independent investor who specializes in growth stocks. Finding and researching new investment opportunities is a thrill. For the past ten years I have been a guest host on a radio talk show about investing, but I am not currently doing that. For my part-time job, I participate in a non-profit that manages a 21-acre inner-city nature park. My other part-time job is more relevant to this website, i.e., writing. I have several hundred publications including stock market newsletters, essays on financial topics, newspaper editorials, and history articles. I have written a history book about a forgotten tycoon from the Roaring Twenties who used a silent film to promote the sale stock in his company. It was published in 2013 by Syracuse University Press. Also, I had a monthly history column in a local magazine that was based on finding the exact location of a historical event and then visiting to see what was there now. I used this same technique to investigate an 1871 murder by one of my ancestors in a small Canadian town. My interest in history is based on trying to understand why my ancestors behaved so badly. Two of them were hanged in public and another killed himself by drinking acid. Several others vanished leaving behind wives and children, or just children. There is a lot of good material here. 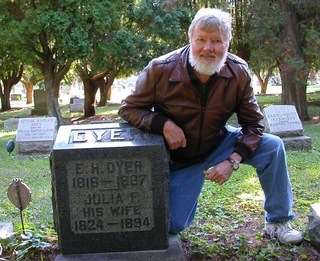 I am currently researching my great great grandfather, Eseck H. Dyer, who left his wife and four kids on the farm to join the Union Army during the Civil War at the ripe old age of 46. And it did not work out well. I went to graduate school at the University of Michigan to get a Ph.D. in philosophy, but I left with only an M.A. degree. Since there were very few academic jobs available at the time, I may have saved myself some frustration. I did teach a symbolic logic course at Michigan for a year or two. The highlight of my academic career at Michigan was writing my “Form Response to a Form Rejection Letter.” It became sort of an underground cult classic among unhappy jobseekers, but it certainly did not advance my career. Another favorite of mine from that era was a document called “On Sobriety” which was a response to someone who claimed that drinking too much must be a disease because it had symptoms. I recounted the symptoms of sobriety, including my favorite: “…a costly passion for fresh fruit and vegetables.” I have an unfortunate ability to see the humor in things that others take seriously; that did not necessarily endear me to any of my managers when I made it into the business world. I left Ann Arbor to seek my fortune in Houston like many other people at the time. I picked Houston because I could play tennis year around and the fishing was good. Also, back in those days of the Global Cooling scare, the media was predicting the next ice age so I figured I could get a few more years out of a warm place before the glaciers moved in. I didn’t have enough respect for authority to be happy in the corporate world so I saved money and invested heavily. I had real estate in Houston, Las Vegas and Tampa. When the Internet became available, I started trading stocks on-line and I never looked back. I achieved exit velocity from corporate America in 1999—a wage slave who bought his freedom.